Kingdoms are all around us. They are the communities that unite us. We're playing with a colony ship as our Kingdom. We're still years from the target system when we pick up the signal. Could this be first contact with an alien intelligence? Unfortunately, it's light years out of our way. This is our Crossroad: do we change course to investigate? The colonists are excited even if it means abandoning our carefully calculated settlement plans. But by now all the players suspect that Captain Browning (ahem, *Acting* Captain Browning) cares more about looking like a good leader than being one. He's in charge and he wants to keep it that way. My character tells the Captain that the data's conclusive: the signal is definitely not natural. But she also mutters that if we're abandoning the plan and just making things up as we go along, pretty soon everyone is going to want a vote. I'm Perspective so what I predict is true. A Touchstone character showed us what the people wanted. But the Captain has Power. He decides what we do. And I just told him that if he does what the people want his precious authority is going to be a thing of the past. Your Kingdom can be any group or organization that interests you. You could play a Wild West frontier town, a colony ship crawling to a distant star, or a sprawling Empire holding conquered peoples beneath its thumb. As you play, you'll confront your Kingdom and your characters with Crossroads, critical decisions that may change your community forever. What will your Kingdom do? What will it become? Strive to make your Kingdom live up to your ideals... or watch as it burns. The Kingdom is in your hands. The question is: will you change the Kingdom or will the Kingdom change you? Includes over twenty sample Kingdoms to get you started quickly, from the mercenaries of the Banner of the Black Serpent, to the galactic weapon-smiths of Starfall, to the wealthy dilettante mystics of the Eye of Osiris, to the devoted doctors of Sawyer Memorial Hospital. 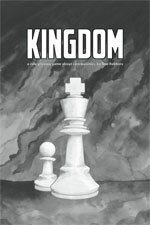 Kingdom was designed by Ben Robbins, creator of the award-winning role-playing game, Microscope. For two to five players. No GM. No prep. » GMotW: Kingdom and narrow roles. » "We're not arbiters of peace. We arbitrage peace. That's different." Keep up with all the latest on the ars ludi blog.